The whimsical wallhanger styles that are pictured below can be woven for you in the size and colors of your choice. Tina always has some whimsical wallhangers available for immediate sale. 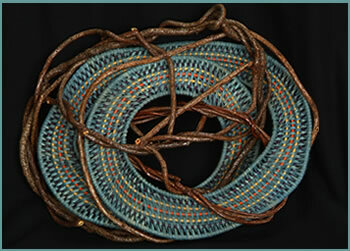 Please contact Tina directly to make a purchase or to commission a custom woven whimsical wall sculpture. 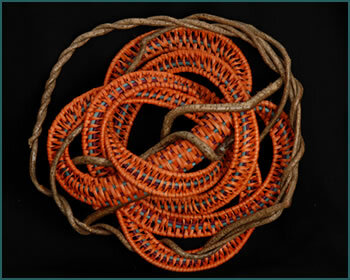 H 16" W 15" D 6"
Framed out of bittersweet and woven in orange- colored reed with teal and amethyst colored spokes. 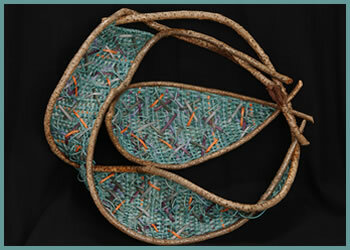 This work of woven basket sculpture looks great hung either horizontally or vertically. H 16" W 22" D 5"
Framed out of bittersweet and interwoven with countryblue reed and purple, yellow and orange spokes. This sculpture looks great hung either horizontally or vertically. Woven in aquamarine and accented with orange, light and dark blue, plum and green.